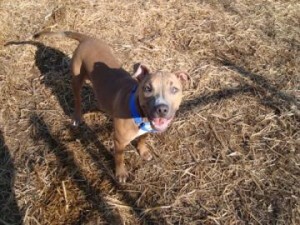 My debut on the BARCS website! … but the real star is Foxy Brown! She is a wonderful sweet little dog who charmed the socks off of me and Michael this Saturday. March Madness at BARCS — only a few days left! 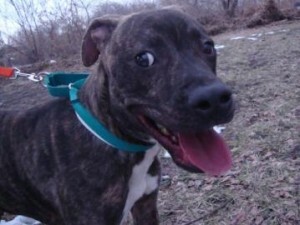 During “March Madness” at BARCS, some pets will have a $0 adoption fee! 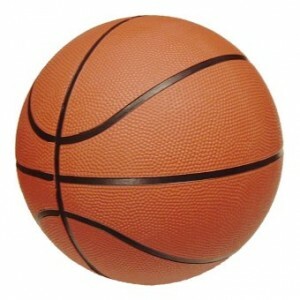 They are marked by a small picture of a basketball clipped to their cages. Normal adoption procedures apply but the regular $65 adoption fee will be waived for these animals. Baltimore city residents still pay the $10 city licensing fee. 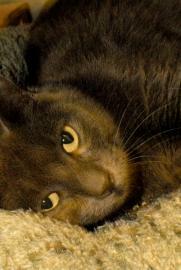 Also this month microchips are only $20 (regularly $35). The chips are only $5 if you adopt from BARCS! This one was named Chicken Wang. He was quite a character! I also like this cat. So cute! 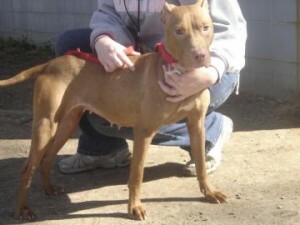 A few weeks ago I met a really sweet dog at BARCS named Ambrosia (her picture is at the top of my March 12 entry). 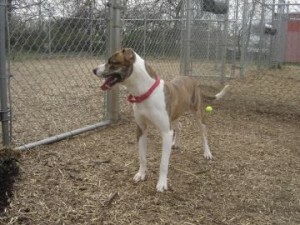 She was very loving and seemed like she might do well with other dogs. 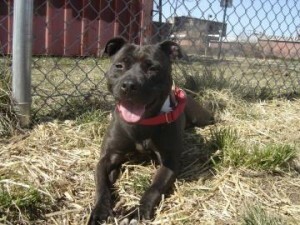 The next time I stopped by BARCS I noticed that she wasn’t there anymore, so I hoped she had been adopted. 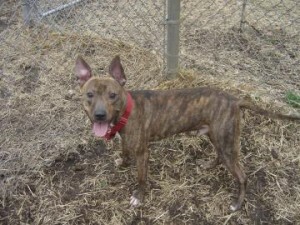 A few days later, by chance I came across the website for a group called Ruff Life Rescue based out of Rising Sun, MD. 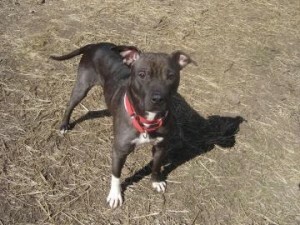 Ambrosia had been picked up by them and is living in foster care! I contacted Ruff Life and arranged for Ambrosia to meet my dog Cocoa to see how they would get along. Unfortunately I think Cocoa may have been a bit much for little Ambro, and they just didn’t seem destined to be BFF. But it was worth a shot, and she is a really sweet little girl! 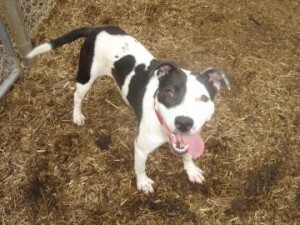 She is still available from Ruff Life Rescue along with a lot of other really cute dogs! Adopting a dog from a rescue group gives you the opportunity to find out specific information about how the dog does in the home environment and how they get along with other dogs, cats, and children. 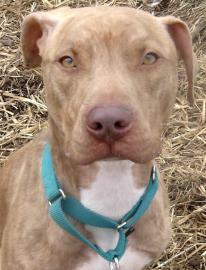 Check out the available pets from Ruff Life Rescue on Petfinder here. 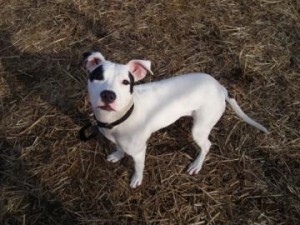 One other pup whose name was something funny, like Bugle Bug or something like that doesn’t have a picture on the website but I have been thinking of him a lot. He was very sweet and super thin (he weighs only 28 lbs even though he should probably be 50 or 60). He was very gentle and polite and even though his hair was falling out on his back from being so thin, the hair on his head was silky smooth. I hope to see him gain some weight and come into his own a little more. I’m thinking he is going to be a real sweetheart. Nothing contained in this article shall be construed to prevent a municipality from adopting or enforcing its own more stringent program for the control of dangerous dogs provided, however, that no such program shall ban, regulate or address dogs in a manner which is specific as to breed. How long, Pennsylvania? 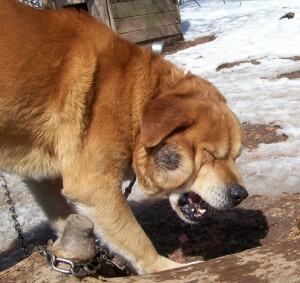 How long must chained dogs wait for a law protecting them from this abuse? 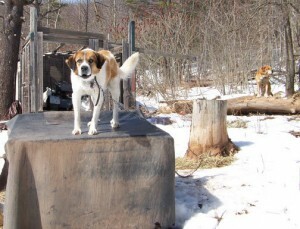 Dogs Deserve Better had heard rumors of dogs chained in the mountains off Gypsy Camp Hollow Rd. in Tyrone, Pennsylvania. An anonymous tip on the location sent them out to investigate the situation. 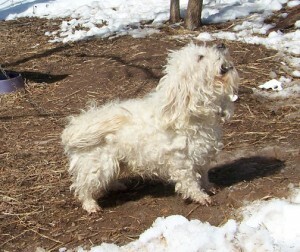 On the abandoned property are seven dogs, all suffering in a variety of ways: each is full of hook and whip worms, one dog cannot see, one has a cracked and bleeding tumor on his face, one little dog is matted from head to tail, and the worst one has a major protrusion in her vaginal area. One dog died during the January cold snap. This scenario repeats itself in towns all across Pennsylvania, as dogs await passage of a new bill which would limit the chaining of dogs. Tethering of dogs on a continual basis is cruel for many reasons, not the least of which is the danger of death in sub-zero temperatures. Because dogs are pack animals, they can become neurotic or aggressive due to lack of socialization with humans, and last year three Pennsylvania children were reported seriously injured or killed by chained or penned dogs. The real tragedy is that the cruelty and danger caused by tethering dogs is completely avoidable through legislation. The new legislation would limit chaining in Pennsylvania, resulting is safer towns for our children and more compassionate living for Man’s Best Friend. Dogs Deserve Better, a national nonprofit working to end the suffering of dogs kept perpetually chained or caged, is joining with organizations and individuals state-wide to form a coalition to Unchain Pennsylvania’s Dogs and get this law passed to end this abuse. So far four states have passed limitations on chaining: California, Texas, Connecticut, and Nevada. Hundreds of cities and counties have passed limitations or flat-out bans. 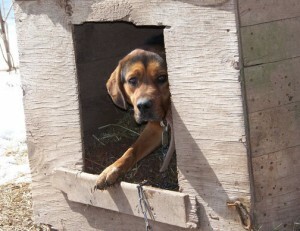 Please visit the websites at UnchainPADogs.com or DogsDeserveBetter.org to learn more about dog chaining, the reasons it is cruel to dogs and dangerous to humans, and to sign up for the coalition to pass a law. 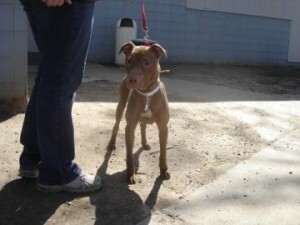 Photos and video of Pennsylvania chained dogs is available by contacting tddb@dogsdeservebetter.org. Watch the video of these seven dogs at: http://www.youtube.com/watch?v=8PzFFjKUBxc. Please help us pass a law that will stop these abusers from torturing anymore dogs! Join our coalition today at http://www.unchainpadogs.com. Contact your local Pennsylvania State House Reps and Senators and tell them, NO MORE! The abuse stops here and now. Update: Central Pennsylvania Humane Society is working on this case now that we’ve reported it. They were out there both Saturday and Sunday, March 6-7 with the police. Yesterday we went to see if the dogs were still there. They were, but there were two vehicles there and they were cleaning up some of the feces. They were screaming obscenities at me because I stopped to look at them. The abusers pulled two dogs out of there, the chihuahua and the matted white dog. 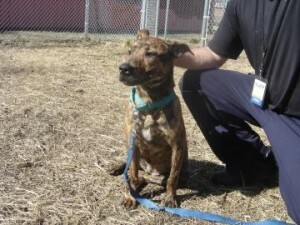 The humane officer is going back out now, March 8, to force them to get vet care or give up the dogs, so he tells us. Problem is, it’s still not illegal to take a dog and chain it up out in the woods. THIS MUST BE STOPPED! IF YOU LIVE IN PENNSYLVANIA, PLEASE MAKE THE PHONE CALLS TO YOUR REPRESENTATIVES, AND PLEASE JOIN OUR COALITION AT HTTP://WWW.UNCHAINPADOGS.COM. Tell the Central Pennsylvania Humane Society to release these dogs to Dogs Deserve Better if they are relinquished so they can be rehabilitated and find new, inside, loving homes. 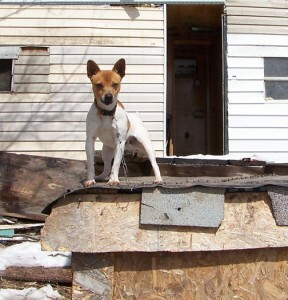 Did you know they have not yet joined our coalition to pass a tethering law in Pennsylvania? Tell them to join the Coalition to Unchain PA Dogs, AND to work these cruelty cases and bring them to fruition. 814.943.7575. Tell Blair County DA Richard Consiglio you expect animal cruelty cases to be tried AND convicted. 814.693.3010.